Nelson archive at Amherst: A one-of-a-kind trove reveals what rural 19th-century American boyhood was really like. 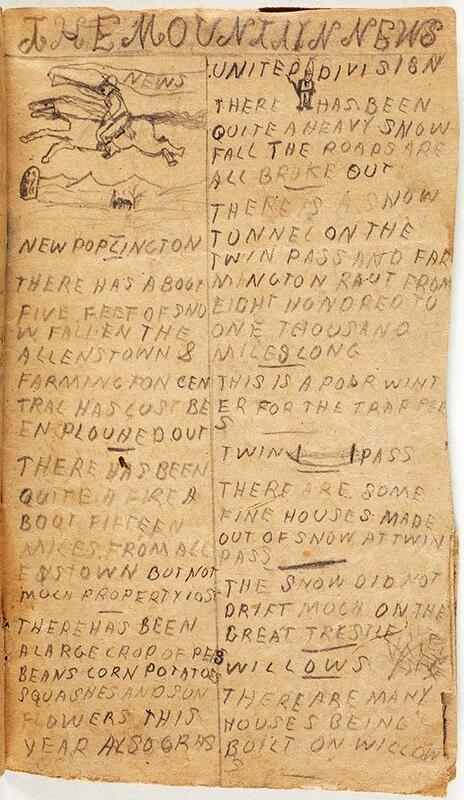 An astounding, one-of-a-kind trove of stories and drawings reveals what life was like for young men growing up in rural 19th-century America. The Nelson family. L to R: Hial, Ernest, Ida, Walter, Elmer, Arthur. In 2013, Pamela Russell was at an auction house in southern New Hampshire when, she writes, she “stumbled across a flimsy, old shoebox filled with tiny, carefully constructed, handwritten books.” Russell, who works as a curator and educator at Amherst College’s Mead Art Museum, didn’t get too close a look at the collection before she had to decide whether to bid on it, but she knew she wanted to own the books, “if only to be able to spend more time with them.” Russell won the auction and stayed up late looking through the collection, counting more than 60 volumes. This was the Nelson Brothers’ “library”: newspapers, seed catalogs, and storybooks, all authored by the boys. The books are illustrated in careful detail, filled with run-on sentences in all caps, and laid out in imitation of the reading material the brothers devoured in front of the kitchen cook-stove. The Nelson Brothers archive is now kept in the Amherst College Special Collections, which has digitized the books. 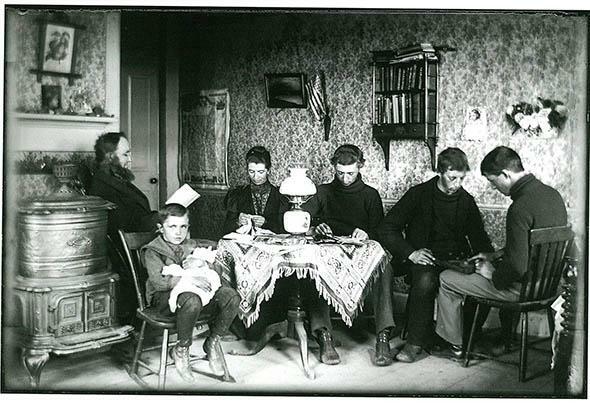 Last year, a history seminar at Amherst launched a website compiling transcriptions of many of the works, photographs of the Nelsons’ family life (taken by Elmer and Arthur), and Nelson-related material from the Goshen Historical Society. The project makes it easy to read all of the Nelsons’ surviving work, start to finish. A seed catalog featuring real and imagined seed varieties, described in rich detail by the Nelson brothers and presented in a two-column format. 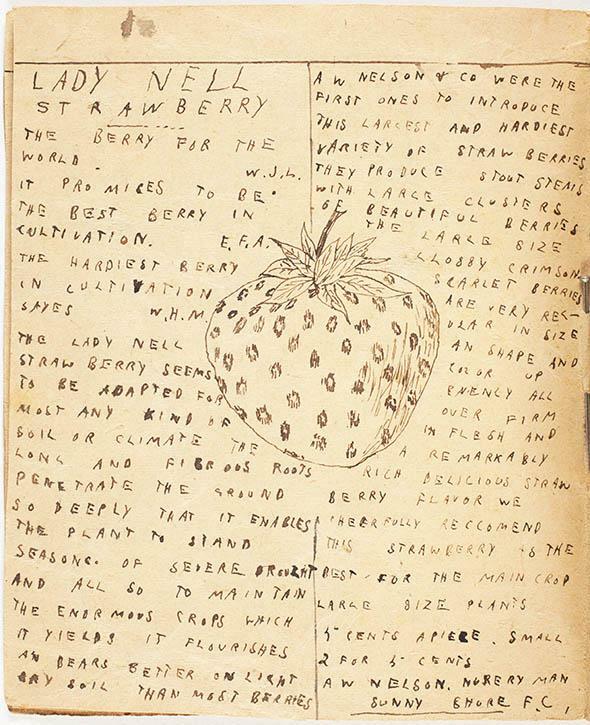 The Nelson archive is a unique artifact of 19th-century American childhood. “I really have not found anything like them, in terms of the fullness of a collection of material produced by not particularly affluent or highly educated kids,” Karen Sánchez-Eppler, a historian at Amherst (and the professor who led that seminar), told me over email. “Archives hold what has been thought worth collecting,” she has written. “On the most practical level, childhood and most especially child-made things have generally not been deemed significant in this way.” Of the juvenilia that does get saved, literary scholar Christine Alexander writes, examples that make it to historians’ eyes tend to have been made by “the upper- or middle-class child who had the privilege of education and whose early attempts at authorship are most likely to have survived.” (Good examples are juvenilia by the Brontës, or Jane Austen.) 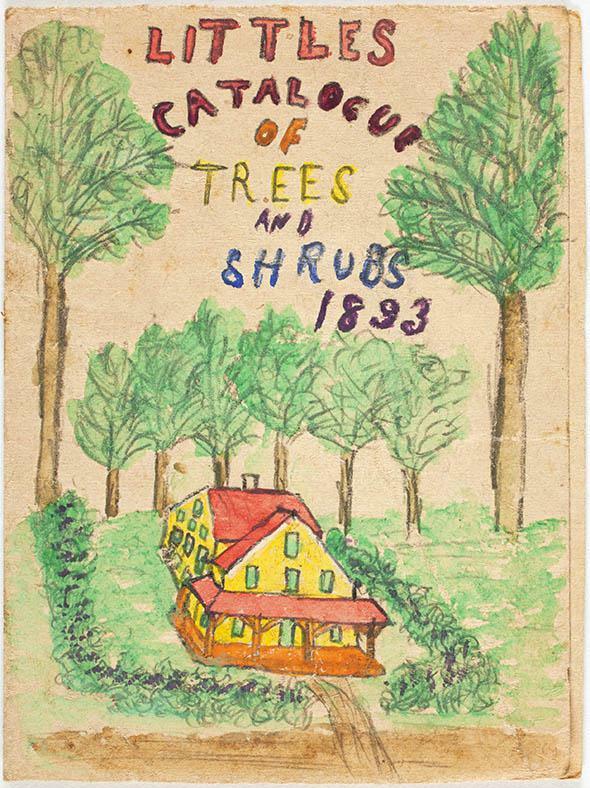 An existing set of 19th-century juvenilia produced by children like the Nelsons—farmers’ kids, who lived in a rural setting and didn’t go on to become famous authors—is rare. Reading the Nelsons’ books, we get a unique perspective on late-19th-century American childhood, learning how farm kids felt about farm work; how young, rural readers processed and remixed the books and magazines they read; and how boys absorbed the era’s ideas about manhood. Like the Brontës, the Nelsons created an imaginary world—what scholars call a “paracosm”—and all of their stories took place inside of it. The Nelsons’ paracosm, the Big, Long, and Round Continents, had a history of war and colonization and was undergoing rapid and enthusiastic infrastructural development and agricultural improvement. This backdrop provided plenty of room for adventure stories, but also for world-building of a more prosaic nature. 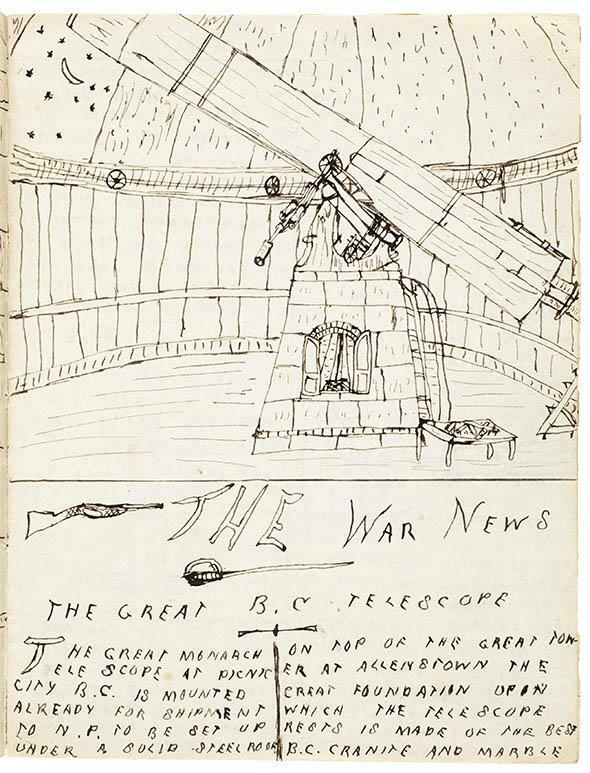 Most of the publications that the Nelsons created were for imaginary readers who lived on one of the continents: newspapers like the Chit-Chat, which reported on the visits of residents of one continent to another; seed catalogs trumpeting varieties specially adapted to the growing conditions in an imaginary place; and “history” books remembering military events like the fictional Battle of Poplington. The boys were also loyal subscribers to juvenile newspapers like the Youth’s Companion and Young People’s Weekly, and these publications were highly influential on the style and presentation of their own magazines and newspapers. (Here’s a copy of The Youth’s Companion from 1890, around the time the boys began to be avid readers.) The Nelsons published stories in serial form, splitting installments across successive issues of their newspapers, like the youth publications of the day. Most of their pages were laid out in the style of Youth’s Companion: Two columns per page, with illustrations “set” into the text. (There are a few examples in the Nelson library of newspaper pages with blocked-out blank areas, ready for illustrations that never came.) Each Nelson newspaper or magazine ends with classified ads for goods available to subscribers who wished to “send away” to purchase books, games, or catalogs. A Jan. 30 issue of the Nelson brothers’ periodical from an unspecified year, featuring stories from around their imaginary world. The boys were resourceful in their reuse of paper, which might have been scarce in their house. They wrote on an envelope from a Bible publishing company, what looks like a botanical image from a seed catalog, the backside of a patent medicine advertisement, the reverse side of a program for a Bible Society meeting, the reverse side of a solicitation letter from a newspaper looking for young distributors, and on the back of a life insurance payment receipt. Like the more famous archive of Emily Dickinson’s poem fragments, some of which appear on envelope flaps and chocolate wrappers, the Nelsons’ books give us a little window on the kind of paper that would have been floating around a 19th-century household. Elmer Nelson’s sketch of a house and barn, made on the reverse of what appears to be a schedule for a meeting of a Bible Society. H.F. Nelson, the secretary of the society, was the Nelsons’ father, Hial. Before they were settings for stories, the Big, Long, and Round Continents of the Nelsons’ paracosm were physical locations: rocky islands in a brook near the house the family occupied in the late 1880s. (The Amherst students in Sánchez-Eppler’s seminar visited Goshen and took a photo of the brook.) When the Nelsons moved in 1891, wrote Walter in 1897, the boys lost their original site, but recreated the “world” on a bank of the brook near their new house. Here they put even more time into construction, cutting down trees and building “roads,” digging out parts of the bank to make caves, constructing forts, a bridge, a “railroad,” windwheels, a dam, and even a small sugar-house for boiling down sap from a little sugarbush. 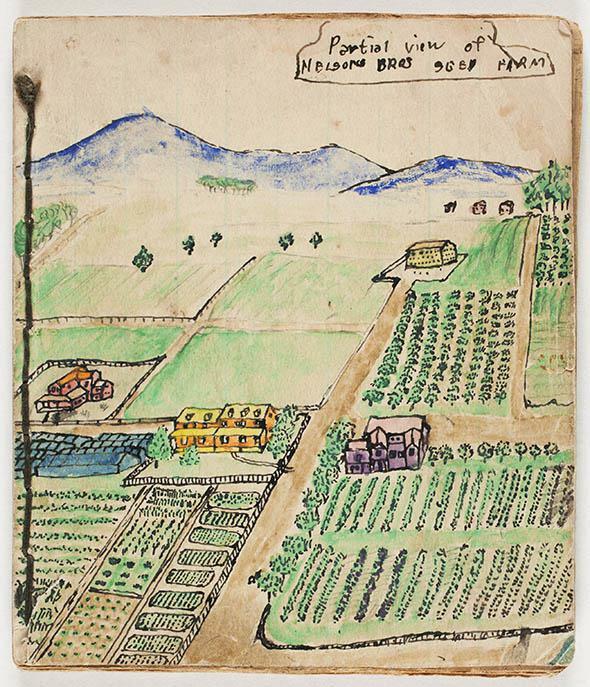 A detailed attempt by an unidentified Nelson brother to map out the geography, natural resources, and agricultural production of their imagined world. The trampled-down poplars and collapsed dugouts of the real-world “Continents” had a much fancier imagined equivalent in the paper landscapes that the Nelsons labored to create at night. The Continents had all of the latest improvements available in the 1890s. 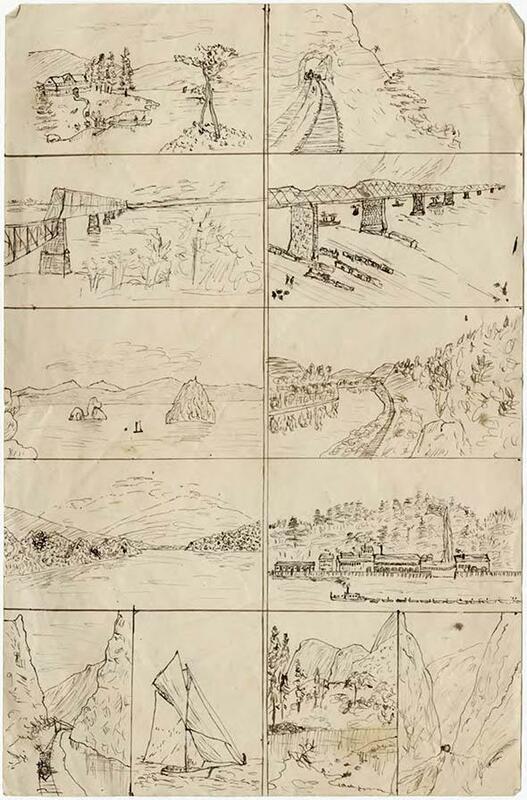 It’s not clear which brother enjoyed drawing dams and trains, but there’s one hand that produces illustration after illustration of infrastructure. Infrastructure illustrations ranging from simple flags to sweeping landscapes and detailed horses and ships. An issue of one of the Nelson brothers’ periodicals, published by their fictitious enterprise, the War News Pub. Co. The opening story, “The Great B.C. Telescope,” tells in great detail of a new telescope being mounted at the fictional Allentown. The three often fought battles against each other in their paracosm’s imaginary world, with the youngest, Walter/Ethan, on his own against the older allies, William/Arthur and Burt/Elmer. There’s an interesting dynamic to the Ethan-Will antagonism, which stretches throughout the stories in the various publications: The older brothers (William/Arthur and Burt/Elmer) often let Ethan/Walter win. The rivalry has no real villain or hero figure; all three are staunch and brave, yet they fight against each other, marshaling huge imaginary armies. Their literary wars are more like the battles of boys in the woods, waged wholly in imaginary terms, with cries of “I got you!” sufficing to declare victory. In sixteen ninty two Clumfield sailed over the ocean blue. “Indians rushed out everywhere.” Feb. 4, 1893. The Nelsons broke up their stories of adventure and war with a pragmatic genre of prose: seed catalogs and agricultural publications. The Intellectual Farmer offered its readers on the continents advice on seasonally appropriate tasks (“NOW IS YOUR TIME TO REPAIR YOU CARTS AND OTHER TOOLS”) and a place to exchange boasts over productivity (New Poplington bragged: “WE HAVE 20 OR 30 MILLION WATER MELON PLANTS UP NOW WHO CAN BEAT THAT”). In this edition of a realistic periodical the Nelson brothers provide farm notes, new product reviews, crop recommendations, prize money for the best name for a new variety of tree, and condensed farm news arranged by town. This kind was first found in a tomb where lay a mumy, it was plantid and grew when it got ripe it was found to be a prolific and early sort and also something not know before, this wheat might have been with the mumy hundreds of years but it had kept all right. It was named the name it is because the name of the nation was not known of whom this mumy was once once. A portion of a fabricated seed catalog featuring illustrations and an advertisement for “Our Little Gems,” 1893. I grew up in a rural town in New Hampshire, separated by about 65 miles and 100 years from the Nelsons’ Goshen. Even when I was young, I thought I had been born too late (my rabid fandom of Laura Ingalls Wilder’s Little House books may have contributed to this nostalgia for a Time Gone By). I wanted to play in the creek and see wolves; to churn butter and do laundry outside; to pour boiling maple syrup onto snow and eat the hardened results. I didn’t have a good grasp of historical chronology back then, but if I had been pressed to define my “Time Gone By,” I would probably have been generous: any time before the advent of widespread electricity in homes would have seemed wild enough to suit me. The Nelson brothers, who were living in that pre-electric time, longed for a bygone age just as I did. Sure, they grew up in the 19th century, and they had woodland adventures aplenty, but they were farm boys living at a time of rapid urbanization. New Hampshire had lost many of its farmers to industrial jobs and town life in more populous parts of the state and in Massachusetts. 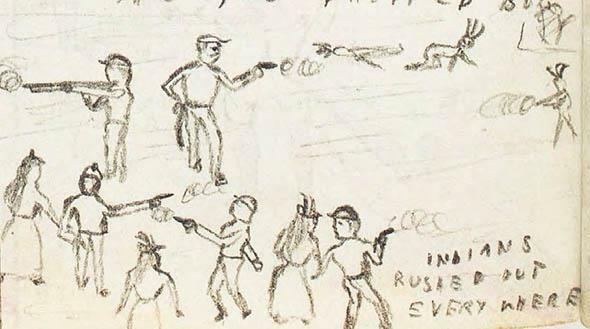 The boys idealized combat with “Indians” (long absent from all of the Northeast, and confined to reservations in the West) and wished to encounter wolves and panthers (extirpated from New Hampshire for almost a century). Their hero Ethan Allen died a hundred years before they used his name and likeness as a shell to write fictions about a vigorous colonizer. 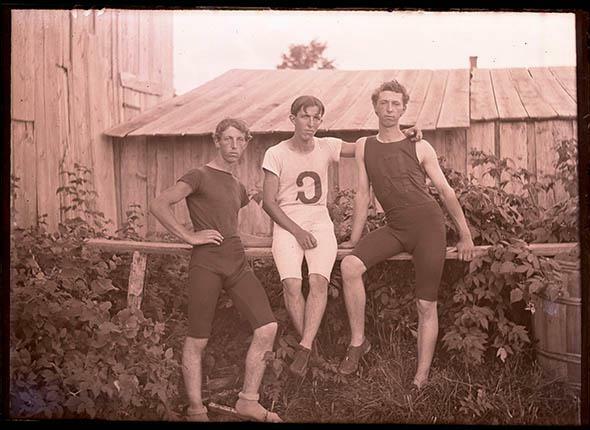 Elmer, Arthur, and Walter Nelson in Athletic Suits. Sometime in the mid-1890s, the Nelsons stopped writing about the continents. (Because they dated their publications inconsistently, it’s hard to be exact about this chronology, but it seems like they worked on their continents library for about three years.) The end of this phase of their lives was unceremonious; there’s no goodbye issue of the Mountain News or the Intellectual Farmer. The brothers simply grew up and got interested in other things. Walter, at least, never lost the Nelson penchant for storytelling. At age 75, he wrote a history of the town of Goshen, where he and his brothers had gone on to open a creamery together. At one point, Walter describes an incident he witnessed firsthand in 1920, when he and three others went into the streets of Goshen in the middle of the night to apprehend a drunken lumberman who had held up two businesses in nearby Newport. The man drew a gun, and, Walter “the only one of the group armed, took a quick shot from the hip … by good-fortune the bullet creased the heel of [the lumberman’s] gun-hand, numbing it.” The threat was disarmed. For a moment, Ethan Allen lived again.